John Hancock - John Hancock was President of Congress during the debate about the Declaration of Independence and during its signing. His signature is the first and largest on the Declaration. He was one of the wealthiest men in the thirteen colonies and served as Governor of Massachusetts for many years. Learn more interesting John Hancock Facts here. Button Gwinnett - Button Gwinnett was the first governor of Georgia and a signer of the Declaration of Independence. He was tragically killed in a duel with a rival less than a year after signing the Declaration. Read more about Declaration of Independence signer Button Gwinnett here. Lyman Hall - Lyman Hall lived in the fiercely anti-British St. John's Parish in Georgia when he signed the Declaration of Independence. Lyman Hall was a doctor by profession and was heavily involved with procuring food and medicine for the Continental Army. Read more about Declaration of Independence signer Lyman Hall here. George Walton - George Walton was one of the youngest signers of the Declaration of Independence at only 26 years of age. George Walton was appointed a Colonel in the Continental Army and was seriously wounded and captured by the British during the Battle of Savannah. Read more about Declaration of Independence signer George Walton here. William Hooper - William Hooper's father was a loyalist to the British Crown who actually disowned his son because he supported the cause of the Revolutionary War. William Hooper was dragged through the streets at one time earlier in his life for supporting North Carolina's colonial governor. Read more about Declaration of Independence signer William Hooper here. Joseph Hewes - Joseph Hewes was a wealthy merchant who spent his time in the Continental Congress creating the United States Navy. He appointed America's first naval hero, John Paul Jones, to his position. Joseph Hewes never married. He was engaged at one point, but his fiance died. He worked night and day during the Revolution until his health began to fail. He died tragically from overexertion during the war. Read more about Declaration of Independence signer Joseph Hewes here. John Penn - John Penn was a self-taught lawyer whose main duty during the Revolutionary War was to keep the North Carolina militia supported with supplies. His efforts helped the Continental Army drive back Lord Cornwallis' army in retreat in 1780. John Penn signed America's first governing document, the Articles of Confederation, as well as the Declaration of Independence. Read more about Declaration of Independence signer John Penn here. Edward Rutledge - Edward Rutledge was the youngest signer of the Declaration at 26. He strongly opposed independence from Great Britain during his time in the Continental Congress early on, but encouraged the rest of the South Carolina delegation to vote for independence on July 2, 1776, for the sake of unity with their colonial brothers. Learn more about Edward Rutledge here. Thomas Heyward, Jr. - Thomas Heyward was the son of a rich planter who signed the Declaration at the age of 30. He was injured and captured by the British during the Battle of Charleston. He spent a year in a prison camp at St. Augustine, Florida before the war ended. Thomas Lynch, Jr. - Thomas Lynch was a young man appointed as a captain of the South Carolina militia when the Revolutionary War started. He contracted swamp fever that left him sickly for the rest of his life. During the middle of the war, he and his wife left for the south of France in hopes that the weather there would be better for Thomas' health. They were never seen again and are presumed to have been lost at sea. Arthur Middleton - Arthur Middleton was an extremely wealthy rice planter in Charleston, South Carolina. His father, Henry Middleton, was the president of the First Continental Congress. Despite the fact that they knew their wealth would be put at jeopardy if America were to go to war with Britain, both Arthur and his father, put the interest of freedom ahead of their own personal prosperity. Their plantation was ransacked by the British and Arthur was captured in the Battle of Charleston, spending nearly a year in a prison camp. Samuel Chase - Samuel Chase was a prominent Maryland lawyer who was involved in the public destruction of British stamps in Annapolis during the Stamp Act crisis. He was appointed to the Supreme Court by George Washington, but was later impeached during the administration of Thomas Jefferson. Read more about Samuel Chase here. William Paca - William Paca was a prominent Maryland official who had served as mayor and councilman of Annapolis, delegate to the General Assembly of Maryland and delegate to the Continental Congress. Paca was a firm supporter of American principles from the days of the Stamp Act all the way through to the days of the Revolutionary War. Thomas Stone - Thomas Stone was a wealthy lawyer and plantation owner in Maryland who served diligently on the Committee of Confederation appointed by the Continental Congress. This committee eventually produced the Articles of Confederation, which was the ruling federal document from 1777 until the creation of the US Constitution in 1787. He died suddenly at the age of 45 in 1787. Charles Carroll of Carrollton - Charles Carroll was the wealthiest man in the thirteen colonies, who lived on a ten thousand acre plantation in Frederick County, Maryland. He was the only Catholic signer of the Declaration and strongly supported the notion of religious freedom in the newly formed country due to his experience of persecution for being a Catholic. Charles Carroll lived longer than any other signer of the Declaration of Independence, dying in 1832 at the age of 94. He was the only signer to ever see a railroad engine! George Wythe - George Wythe was a wealthy lawyer from Virginia. He trained many young men in the field of law, including one who would become his most famous student, young Thomas Jefferson. George Wythe became the Professor of Law at William and Mary College, making him the first professor of law in America. Richard Henry Lee - Richard Henry Lee was born into such wealth that he never had to work to sustain himself. He was involved in politics as a result and was always a staunch supporter of the rights of all Americans. He led a group that publicly burned British stamps during the Stamp Act crisis. He is also credited with proposing the final dissolution of all ties with Great Britain to the Continental Congress. Thomas Jefferson - Thomas Jefferson is one of the most well known of the signers of the Declaration of Independence. Thomas Jefferson wrote the original draft of the Declaration of Independence. He served as Governor of Virginia, Secretary of State, Vice President and served two terms as President of the United States. Learn more about Thomas Jefferson here. Benjamin Harrison - Benjamin Harrison was the fifth in a long line of politicians from the Harrison family. His son, William Henry, and his great-grandson, Benjamin, were the 9th and 23rd Presidents of the United States. As Chairman of the Committee of the Whole, Benjamin Harrison led the discussions in the Continental Congress leading up to the signing of the Declaration of Independence. Learn more about Benjamin Harrison here. Thomas Nelson, Jr. - Thomas Nelson was an extremely wealthy planter and merchant from Yorktown, Virginia. Nelson became a military leader in his home state and worked endlessly to acquire supplies and ammunition for the American troops, even spending large portions of his own money. During the final Battle of Yorktown at the end of the Revolutionary War, Thomas Nelson encouraged General George Washington to destroy the Nelson family mansion because it was being used as a headquarters for British General Charles Cornwallis. Francis Lightfoot Lee - Francis Lightfoot Lee comes from one of the most famous families in American History. He served in the Continental Congress alongside his older brother Richard Henry Lee. He served for many years in Virginia politics before the Revolutionary War and became a staunch supporter of American rights from the time of the Stamp Act in 1765. Read more about Francis Lightfoot Lee here. Carter Braxton - Carter Braxton was a very wealthy landowner and shipping magnate who served in public office for most of his life. Braxton agreed with the principles of the American Revolution, but did not at first support independence. He later joined the patriots in signing the Declaration of Independence. Carter Braxton lost most of his wealth during the war. His ships were captured by the British and many of his landholdings were pillaged. Robert Morris - Robert Morris was one of only two Founding Fathers to have signed all three major founding American documents - the Declaration of Independence, the Articles of Confederation and the US Constitution. Robert Morris was a very wealthy Philadelphia merchant who became the chief importer of arms and ammunition for the Continental Army. Without his personal efforts, George Washington's army probably would never have succeeded. Remarkably, Robert Morris died bankrupt and spent several years in debtors prison toward the end of his life. Benjamin Rush - Benjamin Rush signed the Declaration of Independence at the age of 30. He was already a prominent physician by this time. He served as surgeon general in General George Washington's army. He became a strong advocate for prison reform, the mentally ill and teaching the Bible in public schools to promote public virtue. Benjamin Franklin - Benjamin Franklin was the oldest signer of both the Declaration of Independence and the US Constitution. He was a printer, author, philosopher, scientist and inventor. Benjamin Franklin created the first American public library and the first American fire station force. He became a prominent diplomat to Europe and his last public act was to sign a memorial to Congress recommending the abolition of slavery. Read more about Benjamin Franklin here. John Morton - John Morton was a surveyor, farmer and politician from Pennsylvania who served 18 terms in the Pennsylvania colonial and state legislatures. He became a county justice of the peace, a county sheriff and a justice on the Pennsylvania Supreme Court. One of John Morton's most important public acts was to change his vote from no to yes in support of the Declaration of Independence on July 2, ensuring Pennsylvania's vote for independence. George Clymer - George Clymer was orphaned at a young age. He was raised by a wealthy uncle who trained him in business. George became a very wealthy merchant himself and used his knowledge of financial matters to assist the Continental Congress in its financial affairs. His family hid in the woods nearby while the British army ransacked his house during the Revolution. James Smith - James Smith was a Pennsylvania lawyer who never did have great success in his field, but he did serve in many public offices. He was an early supporter of the American cause. Smith was elected to the Continental Congress after the July 2 vote for independence, but he arrived in time to place his signature on the document on August 2, 1776. George Taylor - George Taylor came to America from Ireland as an indentured servant. He worked in the iron forges of Pennsylvania and married the widow of the owner of the Coventry Forge where he worked. He became a very prosperous iron seller. Taylor served in the Continental Congress for a short time, signing the Declaration of Independence, but his more important role during the war for independence was to supply iron equipment and ammunition to the Continental Army. James Wilson - James Wilson studied law under fellow member of the Continental Congress, John Dickinson. He built a successful law practice and became an early supporter of the American cause, though he did not at first support independence. During the war a mob attacked his home because he did not support some parts of the Pennsylvania patriots' ideas. Several were killed on both sides before the city militia put an end to it. George Ross - George Ross was the son of an Anglican clergyman. He built a successful law practice and contributed more to Pennsylvania state affairs than to national affairs. He had loyalist leanings, but decided to go in with the Revolutionists. He was not yet elected when the vote for American independence was made on July 2, 1776, but was in place by the signing of the parchment document on August 2. Caesar Rodney - Caesar Rodney served in various public offices in Delaware and eventually became one of the leading figures for independence in the state. He was heavily involved with military preparations in the central states. Rodney is best known for his nighttime ride through the rain in order to arrive on time to vote for independence on July 2, 1776. You can read more about Caesar Rodney here. George Read - George Read was a successful lawyer and was married to the sister of fellow signer of the Declaration George Ross. Read was the only signer to actually vote against independence on July 2, 1776, though he eventually did sign the document. He later became the governor of Delaware and was a leader in his state to ratify the United States Constitution. Delaware became the first state to ratify. Thomas McKean - Thomas McKean led a remarkable life. Not only did he sign the Declaration of Independence, but he held various public offices including high sheriff of Kent County, militia captain, customs collector and judge at New Castle, deputy attorney general of Sussex County, clerk and member of the legislature, including the speakership of the lower house. He also became President of the Continental Congress, Governor of Delaware and Chief Justice of the Pennsylvania Supreme Court. Read more about Thomas McKean here. William Floyd - William Floyd was a wealthy landowner from eastern Long Island. When the British invaded Long Island in 1776, his family was forced to flee to Connecticut where they remained in exile for seven years. Unfortunately, his wife died there in 1781. When Floyd was able to return to his land with his children, he found his trees and fields destroyed and the house badly damaged. It had been used as a barracks by the British army. 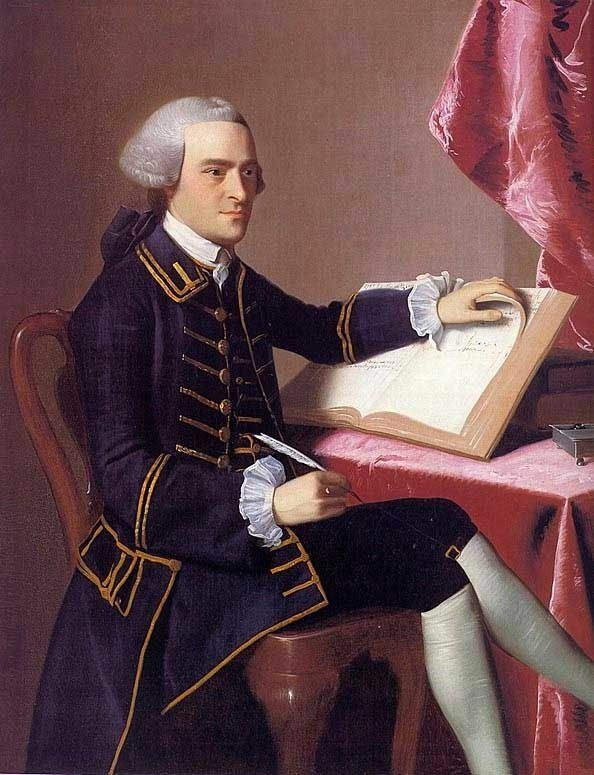 Philip Livingston - Philip Livingston was an extremely wealthy landowner and merchant from New York. After being defeated at the Battle of Long Island, George Washington and his officers met at Livingston's Brooklyn Heights mansion where they decided to evacuate the island. When the British invaded Manhattan, they confiscated the Brooklyn Heights mansion and used it as a Royal Navy hospital. They used his Duke Street home as a military barracks. He died unexpectedly in York, Pennsylvania during the war where Congress had fled from Philadelphia because of the approaching British army. Francis Lewis - Francis Lewis was a wealthy Long Island merchant. He suffered personally more than most of the other signers of the Declaration. When the British invaded Long Island in 1776, his estate was destroyed and his wife captured. She remained in terrible conditions during her captivity where she became very ill. She was eventually released but never recovered her health and died as a result in 1779. Learn more about Francis Lewis here. Lewis Morris - Lewis Morris was the extremely wealthy owner of the vast Morrisania estate in New York. Morrisania was wrecked by the British during the war and he gave much of his fortune to the war effort. He served as a brigadier general in Westchester County during much of 1776. Three of his sons served under General George Washington. Richard Stockton - Richard Stockton was a successful lawyer who was not an early supporter of independence from Britain. Stockton hurried home when the British invaded New Jersey in late 1776. Local loyalists informed the British of his whereabouts and he was captured and imprisoned. He was subjected to very harsh treatment and was eventually released, but never recovered his health. His estate was partially destroyed by the British and he died in 1781 as a result of his captivity. John Witherspoon - John Witherspoon was a minister and was the president of the Presbyterian College of New Jersey (now Princeton University). His son James was killed by the British at the Battle of Germantown during the Revolution. He signed the Declaration and the Constitution and spent the years after the war trying to rebuild the college which was largely wrecked by the British during the war. Francis Hopkinson - Francis Hopkinson was a lawyer and judge, holding many public offices before and after the Revolution. He signed the Declaration of Independence, but was more known during his lifetime for his poems, drawings and songs. He is considered one of America's first homegrown writers and composers. John Hart - John Hart held many political offices in local New Jersey politics before the American Revolution. He was elected to the Continental Congress shortly before the July 2 vote for independence. When the British invaded New Jersey late in 1776, they destroyed Hart's farm and his mills. He escaped into hiding in the local hills. When he returned, he found that his wife, who had been ill at the time of the invasion, had died. He became ill shortly after and died in 1779. Abraham Clark - Abraham Clark was a surveyor and farmer from Roselle, New Jersey. He served in public office for most of his life. During the war for independence, he served in the Continental Congress, as well as in New Jersey's newly formed state legislature. He suffered greatly when two of his sons were captured by the British and held on the notorious prison ship Jersey, where hundreds of Americans died. Read more about Abraham Clark here. Josiah Bartlett - Josiah Bartlett was a successful doctor who held various political offices before and after the American Revolution. His house was burned to the ground, probably by British loyalists, in 1774. He was probably the first person to vote for independence on July 2, 1776, and the first to sign his name to the Declaration after John Hancock. He became the first Governor of New Hampshire. William Whipple - William Whipple was a former sea captain who became a successful merchant in Portsmouth, New Hampshire. He served as a brigadier general in New Hampshire and led four brigades in the Battle of Saratoga that defeated General John Burgoyne's British army, a major turning point for the Americans in the war for independence. Samuel Adams - Samuel Adams, probably more so than any other, was largely responsible for uniting the colonies in their war for independence. He was a fiery leader, whose aggressive views toward the British even alarmed his fellow patriot leaders. He became well known in America and in England for his fiery writings denouncing British policies and politicians. He later became the Lieutenant Governor, and then the Governor, of Massachusetts. Read more about Samuel Adams here. John Adams - John Adams was called the "Atlas of American Independence" by fellow Declaration of Independence signer Richard Stockton. Adams was one of the most active and loyal men in the fight for independence. He served as diplomat, Vice President and President of the United States, as well as signing the Declaration of Independence. He lived to see his son John Quincy become the sixth President of the United States. Learn more about John Adams here. Robert Treat Paine - Robert Treat Paine was originally a clergyman, but later went into the field of law. He served in many public offices and was an early member of the inner circle of Massachusetts rebel leaders, being a close friend of John Adams and John Hancock. He gained national prominence as one of the prosecuting attorneys of the British soldiers involved in the Boston Massacre. Elbridge Gerry - Elbridge Gerry was a prosperous merchant who was integrally involved in the Revolutionary War. He served in various Massachusetts political offices during the fight for independence. He narrowly escaped the British soldiers during the night of April 18, 1775 as they marched toward Lexington and Concord. He served as a leader in raising troops and supplies in both state and national affairs. He later became Vice President under President James Madison. Stephen Hopkins - Stephen Hopkins was the second oldest signer of the Declaration of Independence after Benjamin Franklin. His shaky hand is noticeable in his signature on the Declaration. Hopkins served in various political offices in Rhode Island, serving as governor ten times before the Revolution. During the war, he served on the committee that created the Continental Navy and appointed his brother, Esek Hopkins, as its commander in chief. William Ellery - Unlike many of the other signers of the Declaration of Independence, William Ellery never held any other significant office other than being a delegate to the Continental Congress. He served faithfully in Congress and as a customs officer in his home of Newport for many years. His home and property were destroyed in the British invasion of Newport and he never fully recovered financially. He died at the age of 92. Only signer Charles Carroll lived to be older. Roger Sherman - Roger Sherman spent his early years as a cobbler in the steps of his father, but he worked his way up to the most powerful political offices of the land. He served on the Committee of Five that produced the Declaration of Independence. He is one of only two Founding Fathers to have signed all three major documents of American Independence, the Declaration, the Articles of Confederation and the Constitution. He also introduced the Connecticut Compromise which broke the deadlock between large and small states at the Constitutional Convention. Read more about Roger Sherman here. Samuel Huntington - Samuel Huntington was a cooper (a barrel maker) early in life, but rose to become a successful lawyer, judge and politician. He was the King's Attorney in Connecticut for a decade, but resigned his position in 1774 and joined the Revolutionaries. Samuel Huntington served as President of Congress, Chief Justice of the Connecticut Superior Court and was the Governor of Connecticut for a decade. William Williams - William Williams was a prominent Connecticut merchant who married a daughter of Royal Governor John Trumbull. Williams served in many state and local offices during his life and signed the Declaration of Independence. He raised money and gave of his own fortune for the war effort. He was also a colonel in the Connecticut militia. Oliver Wolcott - Oliver Wolcott was a lawyer and politician from Litchfield County, Connecticut. He was a sheriff, a legislator, a judge and a colonel before the Revolutionary War. He served as a brigadier general in the New York campaigns that culminated in the surrender of British General John Burgoyne at the Battle of Saratoga, New York, and as a major general defending the Connecticut seacoast from the raids of British Royal Governor of New York, William Tryon. Matthew Thornton's signature is at the bottom because there wasn't enough room for him to write beneath the signatures of the other New Hampshire signers. Matthew Thornton was a doctor from Londonderry (now Derry Village) New Hampshire. He served mostly in New Hampshire politics, holding the highest offices of the state, including President of the Provincial Assembly and the State Constitutional Convention, chairman of the Council of Safety and Speaker of the upper house of the legislature. He was not appointed to the Continental Congress until November 1776, but was still allowed to place his signature on the Declaration of Independence. Now that you've read about the signers of the Declaration, test your knowledge with our Declaration of Independence Signers Crossword Puzzle.